What do your skin, a compost pile and Lake Superior all have in common? Each of them is home to an abundance of microscopic germs, properly called bacteria. Bacteria seem to be thought of as ‘simple’ compared to many-celled organisms, but certain motorized bacteria (such as E. coli or Spirilla) reveal immense engineering complexity. These motorized bacteria are hardly ‘simple’. The bacterium swims about with a whip-like cord called a flagellum (plural flagella), driven by a fantastic motor embedded in the outer shell. The flagellar motor is powered by proton flow, and closely resembles microscopic electric motors, powered by electron flow. The motor generates waves in the cord, which drive the germ forward. A bacterial flagellar motor has the amazing quality of combining speed with efficiency. These extremely efficient motors can quickly stop, start, change speeds, and reach a top speed of about 100,000 rpm (revolutions per minute)!1,2 The cell is propelled up to 15 body-lengths per second at top speed.2 If this could be scaled up, it would be like a person of height 1.8 m (6 ft) swimming at 100 km/h (60 mph). It is also very versatile, because it has forward and reverse gears, enabling the germ to reverse direction within a quarter of a turn. Biological flagellum motors are also superior in their minute size. The smallest man-made electric motor weighs 0.37 grams and is the size of a housefly,4 but bacterial motors weigh almost nothing. To view them you need an electron microscope, because they are 25 nanometres (one millionth of an inch) in diameter. Eight million of them would fit in the cross-sectional area of an average human hair.2 Scaling a regular electric motor to this size would bog it down with friction, because water tends to get ‘stickier’ as things are smaller. But it does not cause any problems for the flagellar motor. There are no motors of any type that are as rapid, efficient, and small as flagellar motors in bacteria. Could such a motor that far exceeds man’s inventions be the result of a cosmic accident billions of years ago? Every example of man-made electric motors proves to be primitively clumsy compared to the superior complexity and efficiency of the flagellum motor. The reasonable solution is that motorized bacteria had an all-wise designer, Jesus Christ our Creator (John 1:3; Hebrews 1:2). How do evolutionists explain away such exquisite design? Scientific American’s argument is like claiming that if the components of an electric motor already exist in an electrical shop, they could assemble by themselves into a working motor. However, the right organization is just as important as the right components. Dr Scott Minnich of the University of Idaho, a world expert on the flagellar motor, disagrees with Scientific American. He says that his belief that this motor has been intelligently designed has given him many research insights. Minnich points out that the very process of assembly in the right sequence requires other regulatory machines.2 He also points out that only about 10 of the 40 components can possibly be explained by co-option, but the other 30 are brand new. 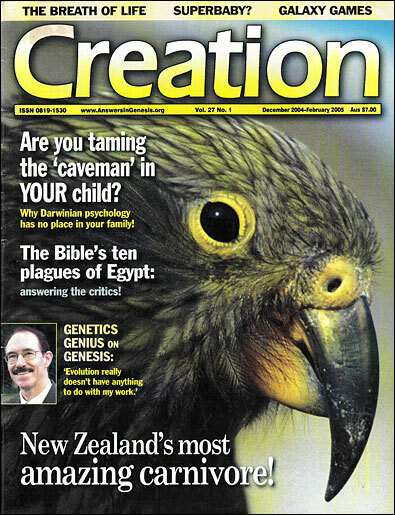 Rennie, J., 15 Answers to Creationist Nonsense, Scientific American287(1):78–85, July 2002; refutation after Sarfati, J., Refuting Evolution 2, pp. 167–170, Master Books, Arkansas, USA; Answers in Genesis, Brisbane, Australia, 2002. Unlocking the Mystery of Life, DVD, Illustra Media, 2002. See Minnich, S www.idurc.org/yale-minnich.html, 25 August 2003. Parker, G., Graham, K., Shimmin D. and Thompson, G., Biology: God’s Living Creation, 2nd ed.,Pensacola Christian College, Florida, USA, pp. 597–598, 1997. Return to text. Brown, W., In the Beginning: compelling evidence for Creation and the Flood, 7th ed., Center for Scientific Creation, Arizona, USA, pp. 17–18, 2001. Return to text. Van Nostrand’s Scientific Encyclopedia, 8th ed., Van Nostrand Reinhold, New York, p. 2014, 1995. Return to text. Smallest motor, americanhistory.si.edu/scienceservice/031005.htm, 25 Aug. 2003. Return to text.